After giving away a run in the top of the first and allowing a second run in the top of the second, Paonia got down to business Tuesday night. The Eagles hit three homeruns and 12 RBIs to defeat visiting Nucla, 16-5, in game one of a non-conference double header. With one out in the bottom of the first inning, senior first baseman Tyler Kendall hit the first homerun of the season, bringing in Michael Wilmore in the process to tie the game at 2-all. In the bottom of the second, senior third baseman Jorge Quinonez hit the first homerun of his career, a 350-foot grand slam hit over center field. And senior catcher Jacob Leon hit a walk-off 3-run homer in the fifth for the win.The Eagles' celebration was cut short, however. Nucla rallied to win game two by a score of 4-3. On Saturday, Paonia swept a conference doubleheader over Hotchkiss, blanking the Bulldogs 9-0 in game one, and scoring six runs in the sixth inning for a 12-6 win in game two. Paonia and Hotchkiss both host league doubleheaders this Saturday - Hotchkiss will welcome Meeker and Paonia will face Rangely. That doubleheader will also be a fundraiser for the family of Greg Podgorny, who is battling Lou Gehrig's Disease. Both series begin at 11 a.m. The Montrose baseball team remains undefeated after seven games. The Indians delivered a crushing 22-4 win on March 16 over Eagle Valley, and defeated Delta 16-1 last week. They hit the road this weekend, playing Montezuma Cortez Friday and Durango Saturday. The Cedaredge boys track team scored 34 points to place ninth overall at Saturday's Mickey Dunn track meet in Grand Junction. Not impressed? Well, consider that the team consisted of two athletes. Jumper Reid Gates scored 20 points with wins in the long jump and high jump. Gates was the only athlete in the high jump to clear 6 feet. His winning jump of 6 feet, 8 inches also set a new meet record in the event. Gates' record was one of only two meet records to fall at this year's invitational. Teammate Dante Markley won the 110-meter high hurdles and placed fifth in the 100-meter dash. Also at Mickey Dunn, Delta's Bryanna Music won the shot put with a throw of 38 feet, 4 inches, and teammate Callie Gafford cleared five feet to place second in the high jump. Chris Black placed second in the men's 300-meter hurdles. Hotchkiss junior Jenni Celis claimed her second meet record at the 13th annual Hotchkiss Invitational. Celis, who holds the record in the 800, won the 400-meter dash in 57.5 seconds. The Hotchkiss girls team scored 94 points to place fourth overall. The Paonia girls won six events and scored 143 and a half points to win the team title. The Hotchkiss boys team finished second with 121 points and three first-place finishes. Bulldog Alex Smith won the 800, Cody Bartlett claimed the 1600, and Kurt Katzdorn finished first in the 3200. Coal Ridge High School scored an impressive 226 points to win the boys team title. Look for more records to fall at this Saturday's Cedaredge Invitational, where highs in the low 60s are forecast. Events begin at 9 a.m. Meet details are available at www.scottmeets.wikispaces.com. If you can't make the meet you can follow it throughout the day. Results will be posted at this site as they become available. And for wrestling fans, this Saturday a team of some of the area's top-ranked high school wrestlers will dual a team from Germany in freestyle, or Olympic-style wrestling, at Central High School in Grand Junction. Wrestling begins at 9 a.m. In local high school sports, there's a long-standing tradition of celebrating state champions with a parade through town. 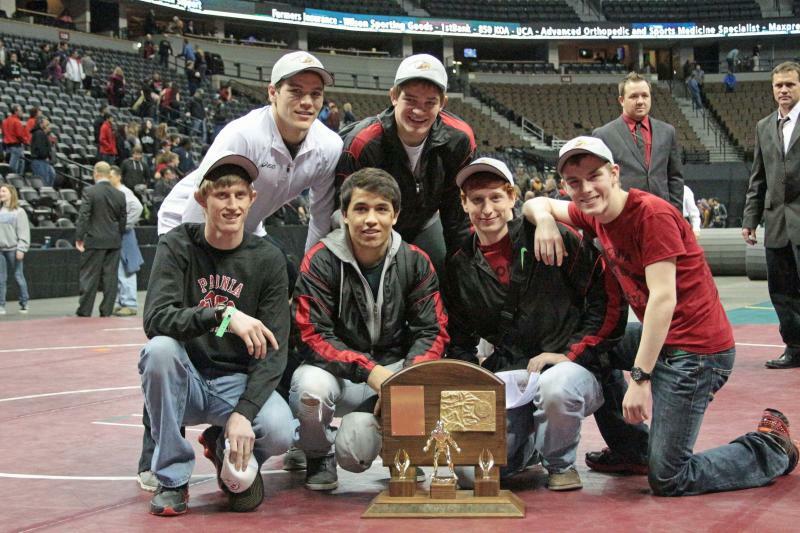 On Wednesday, Paonia was honored for earning a second consecutive state title in wrestling. At the Pepsi Center in Denver last week, Paonia had more wrestlers medal than most teams brought to the tournament. Head coach Andy Pipher worked his way through the weight classes Wednesday, surrounded by his team and from atop Paonia's Ladder One fire truck.